Jackie - Blu-ray review | What Hi-Fi? If Jackie is a snapshot of history, it’s one where the photographer wasn’t quite paying attention and set the timer a little late - missing the main event, and trying to make do. The film is partly based on an interview that Jackie Kennedy (née Bouvier, not Jackie O like Spaghetti-O's, as we all learned from The Simpsons) gave to Life magazine’s Theodore H White in 1963, and tracks the events of her life that immediately followed her husband’s assassination. But because the framing of the film is an interview, we jump around in time - back to a television tour of the White House, forward to Jackie in a graveyard, back again to the moment of the President’s assassination, and so on. Structuring the plot that way isn’t an issue - provided it’s engaging and done well, but Jackie feels a little hollow as we try to get to the heart of the First Lady. Responsibility for that falls partially on Natalie Portman, who’s overly affected breathiness and exaggerated expressions have the effect of alienating us from Jackie when we should be empathising with her against a world that has suddenly become much colder. Perhaps it doesn’t help that our heroine has a need to control the narrative. When she takes a drag on her cigarette, as the unnamed journalist (Billy Crudup) reads back how, “She lights yet another cigarette and, through her soft sobs, explains her feelings," Jackie is quick to correct him: “I don’t smoke”. Historically accurate, we’re sure, but it subconsciously sets up barriers between the audience and the film: is what we’re seeing real or is it another controlled narrative from a more powerful party? Jackie asks that question herself - whether something being written down makes it real. When the journalist replies that “it’s all we have," Jackie responds that “we have television now. People can make up their own mind”. In the political climate we’re living in at the moment, those words are chilling rather than liberating. How much change a year can bring. Speaking of politics, those looking for an insight into the ins-and-outs of events following a President’s assassination will be left wanting. We get a recreation of the gunshot, and impressively effective make-up showing the collapse of John F Kennedy (Caspar Phillipson)’s bloodied head, but it’s all played for visceral impact. There’s a lot that’s been done, stylistically, to give the film a believable veneer of the 1960s. Cinematographer Stéphane Fontaine is keen to keep his 16mm cameras close to Portman at all times, letting her fill the smaller frame. Jackie changes happily between aspect ratios, and, occasionally, archive footage of the real Mrs. Kennedy - some may enjoy this, others will find it jarring, but there’s no doubt that it brings with it the negative qualities of old film that our industry has tried to avoid. Greyscale scenes, with too much grain for comfort, won’t be a great test of your home cinema set-up and even those scenes set in the ‘modern day’ of the 1960s have an almost pastel colour palette that avoids punchy pops and vibrant images. On the bright side, there’s more than enough focus on Jackie preparing her make-up, dress, and her appearance in general (unsurprising, as the film was nominated for Best Costume Design at the Academy Awards), so the detail in clothes and hair should be more than enough of a challenge for your television or projector. The sound is much better though. 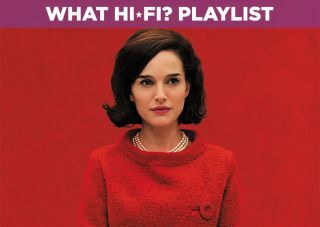 Composer Mica Levi, whose previous work includes Under the Skin, has put together something special for Jackie’s DTS-HD Master Audio 5.1 track. As soon as the movie starts there are dismally sombre glissando strings for your speakers to be getting on with, and you’ll want to be using something that can easily capture the emotional detail in the dialogue of every character in this midrange-heavy film. Most notable is the scene where Jackie remembers the assassination; all other sounds fall away before the gut-wrenching bang of the gunshot. High-pitched, trembling strings rise and then are unexpectedly sucked away into a sonic vacuum. If you want to make sure your kit is up to scratch, these are the sorts of scenes you’ll want to hear. Ultimately, most people will walk away from Jackie unaffected by its plot and unimpressed by its spectacle. Those that knew the history are unlikely to have learnt anything new, while those that didn't might be disappointed that it doesn't go into greater depth. The film is keen to remind us that “there once was a spot, for one brief, shining moment that was known as Camelot”, but really, we’d recommend listening to the Camelot musical instead.